Robert Maggio and Earlene O’Hare. Port Jefferson. Charleston, SC: Images of America, Arcadia Publishing, 2013. Pp. 127, photographs. ISBN: 0738598178. Paper, $21.99. Tricia Foley and Karen Mouzakes. Yaphank. Charleston, SC: Images of America, Arcadia Publishing, 2012. Pp. 127, photographs. ISBN: 0738592951. Paper, $21.99. Recently, I read in the real estate section of a Long Island newspaper a caption for a photograph of Main Street in Port Jefferson, which described the town as “a former whaling village.” Excuse me? Later in the article, the author more accurately cites the actual reason for Port Jefferson’s celebrated maritime heritage: its harbor was well suited to shipbuilding. In fact only two ships of the hundreds built there were whalers. If you’re selling real estate, I suppose whaling sounds more romantic than shipbuilding. But thanks to two recent books in the Arcadia Press Images of America series, those interested in the photographic history of Long Island’s historic villages can find pertinent and accurate information (Newsday, take note). The two books, Yaphank and Port Jefferson, offer views of two of Suffolk County’s older villages and hamlets. The Port Jefferson book is written by Robert Maggio and Earlene O’Hare, both reference librarians at the Port Jefferson Free Library. They worked with the Historical Society of Greater Port Jefferson, which supplied most of the photos. 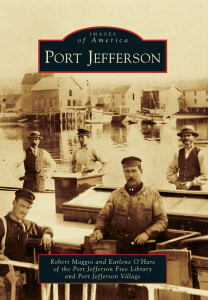 Port Jefferson maintains an excellent website, The Village Digital Archive, http://www.portjeff.com/village-history, which makes available hundreds of scanned images of the surrounding communities for a small fee. The book details the early settlers, dating to 1682, and includes images of two of the earliest houses which still remain. The “Down to the Sea” chapter documents the busy shipbuilding era, beginning in 1797, when the town had the dreary name of Drowned Meadow. The name was changed in 1836 to reflect the growing sophistication of its main industry. “Business” covers the many banks in town, once popular restaurants, and the arrival of the Long Island Rail Road station in upper Port Jefferson Station in 1873, followed by the establishment of ferry service to Connecticut in 1883. Both modes of transportation still exist and contribute to the thriving atmosphere of the then town. The hotel era is well documented, demonstrating how the transition from shipbuilding to tourist destination helped Port Jefferson survive changing times. All of the churches pictured are still standing, and the humble beginnings of its two busy hospitals, St. Charles and John T. Mather, are revealed. Among the town’s notable residents featured in the book are two artists, William M. Davis (1829-1920) and Leon Foster Jones (1871-1940). Overdevelopment of the waterfront by sand mining and oil companies led to a renewed call by environmentalists to reclaim the harbor and preserve its natural resources. The village incorporated in 1963 in order to have greater control of its destiny. Transformation of early industrial buildings has brought new life to the harbor, but the ultimate fate of the Long Island Power Authority facility nearby will surely impact the future of the village. The last chapter covers the nearby incorporated village of Belle Terre, a planned community of wealthy homes developed by Dean Alvord in 1902. Amenities included a club house, golf course, and bridle paths. The gatehouse remains, designed by the firm Kirby, Petit, & Green. The columns and pergola style of the railroad station in Port Jefferson Station remind us of the pergolas which once graced Cliff Road in Belle Terre. By 1933, they lost the fight to erosion and no longer overlook the harbor. The village of Port Jefferson continues to evolve, for better or worse, and keep up with the times, in order to survive into the next century. This book shows us that, despite development pressures, much of its rich history remains in Port Jefferson. The name Yaphank comes from a Native American word meaning “the bank of the river.” The hamlet developed around the river and its busy mills. During the American Revolution, Colonel Benjamin Tallmadge marched with his men through Yaphank on his way to the Manor of St. George in Mastic and The Benjamin Tallmadge Historic Trail today marks his route. 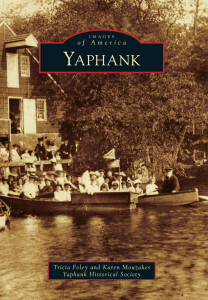 Yaphank was one of the earliest hamlets to establish a historic district in Brookhaven Town. Yaphank’s historic buildings include two churches on Main Street, St. Andrew’s Episcopal (1853), and Yaphank Presbyterian (1851). The latter unfortunately suffered a serious fire in 2013 and may not be rebuilt. Thanks to William Weeks, Yaphank also had several modern octagon buildings, popular in the 1850s: his home and the local school which was later used as a firehouse. A replica remains behind the fire department on Main Street. Ms. Foley and Ms. Mouzakes note its historic place in Brookhaven history and that “all roads lead to Yaphank”. Their well-detailed study provides a glimpse of a fascinating place, its people, its buildings, and its pristine natural environment. The historical society is to be commended for its vital role in preserving this beautiful spot on the Carmans River.